Over the years I have come to wonder why Tarzan was such an immediate success. The premiss on the face of it is absurd. While fascinating it requires such a huge suspension of disbelief as to be staggering. Perhaps that is why such a significant percentage of his contemporary readers were revolted by ERB’s work. He had to put up with a tremendous amount of abuse although his acceptance was greater than his rejection. Something had to prepare the way for that acceptance nevertheless. The discovery of the unconscious that became prominent in the second half of the nineteenth century certainly opened the way for the strange and bizarre. It is not a coincidence that spiritualism and the paranormal became prominent at that time. Along with those came the rise of science fiction and fantasy. Tarzan is fantasy fiction while the Mars series of Burroughs is fantasy sci-fi. Monsters like Dracula and Jekyll and Hyde established themselves in the popular imagination. Anthony Hope’s Prisoner of Zenda and the Graustark knock off by George Barr McCutcheon entranced ERB to the point of distraction. Jules Verne, of course, and the Oz stories of L. Frank Baum. When it came to the Mars stories ERB was merely the best exemplar of what by 1911 was an established genre. The public mind was being softened to accept not only the incredible but the impossible. Printing improvements made both half tone and color illustration less costly and easier to produce. Is it any wonder that ERB’s period is one of astonishing illustrators. Remember that ERB tried to be a cartoonist himself before he took up writing. His goal was judging from his drawings to be a political cartoonist. Thus one can only presume he followed book illustrators avidly. Arthur Rackham was knocking them dead while Denslow’s and John R. Neill’s Oz illustrations must have wowed the envious Burroughs. N.C. Wyeth must have blown his mind. More importantly than the book illustrators though were the emergent four color Sunday Funnies of the newspapers in 1895. They were so exotic and strange even in my childhood but at the time they must have seemed incredible. Of course I had no idea what made them seem exotic. In fact, I had never heard of Ben-Day dots until the fabulous personality posters of the Sixties exploited them. The Ben-Day printing process, named after illustrator and printer Benjamin Henry Day, Jr., is a technique dating from 1879. Depending on the effect, color and optical illusion needed, small colored dots are closely spaced, widely spaced or overlapping. Magenta dots, for example, are widely spaced to create pink. Pulp comic books of the 1950s and 1960s used Ben-Day dots in the four process colors (cyan, magenta, yellow and black) to inexpensively create shading and secondary colors such as green, purple, orange and flesh tones. The Sunday Funnies thus must have had an astonishing effect on contemporary minds. As the comics Bill Hillman has reproduced on his site, ERBzine, indicate ERB was an avid follower of the genre. His earth borer used by David Innes in the Pellucidar series was most likely cadged from a comic strip. Seeking relief from those long weary job hunting days of the first decade ERB sought relief by hanging around the Chicago Public Library. He was a card carrying member too. Who knows what volumes he borrowed or browsed through on the spot. The Library would have had its racks of the country’s newspapers on display including those of NYC. Thus ERB would have been familiar with the comic strips of Winsor McCay, The Dreams of the Rarebit Fiend and Little Nemo in Slumberland. Himself an avid dreamer, very familiar with nightmares, ERB must have relished McCay’s work. As it so happens McCay’s two most famous strips have a prominent place in the history of comics. In fact, just recently the Taschen Publishers issued a one volume complete collection in four color Ben-Day dots of the Little Nemo strip. At a size of 20 x 14 the strips are magnificently displayed. The accompanying 150 page text by Alexander Braun is a wonderful history of the period pointing out many developments that undoubtedly influenced ERB forming a background to his writing. Braun has a touch of genius too. Many strips of the The Dreams of the Rarebit Fiend are included in the ancillary volume, some full page. The Rarebit Fiend strip began a little earlier than the Little Nemo strip of 1905. Thus both strips were running during 1905-09, the period of ERB’s deepest despondency. I will show how both strips are reflected in ERB’s writing. To take the Dreams of the Rarebit Fiend first. Rarebit refers to the culinary dish Welsh Rarebit frequently referred to as Welsh Rabbit. The dish is simply melted cheese on bread although it can be a fondue. In the strip the dreamer overeats before bedtime producing a nightmare. The dreamers are all different while some of the nightmares are quite astonishing. Burroughs’ emulation appears in Jungle Tales Of Tarzan in the story Tarzan’s first nightmare in which Tarzan overeats having the subsequent nightmare. My first reaction to the story was that Burroughs had been reading Freud’s Interpretation of Dreams. While he may have been I think McCay’s strip was a stronger or more immediate influence. 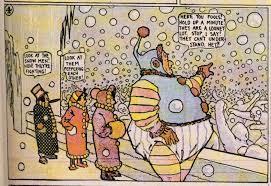 The Little Nemo in Slumberland influence appears in ERB’s first serious effort, Minidoka, put in a drawer and not published until 1998 by Dark Horse Comics. The consensus seems to be that Burroughs wrote this short work c. 1905. The reasoning seems to be that because Burroughs wrote the story on stationery from this period that that proves it was written at that date. However ERB was an inveterate collector, read packrat, until he says he overcame the disease in the early twenties. So he says. So ERB was reluctant to throw anything away. The stationery proves nothing. I have maintained that ERB wrote Minidoka c. 1908-09 based on internal evidence. We can now add the evidence of Winsor McCay’s Little Nemo in Slumberland strip. As the title implies this strip also revolves around dreams. It has a haunting surrealistic feel filled with strange characters and dream effects. As I say, ERB haunted the Chicago library from 1905 to 1911 when he began writing The Princess of Mars. Thus he would have heard of the strip which was quite famous while following it at least periodically. Minidoka reflects a Little Nemo quality. 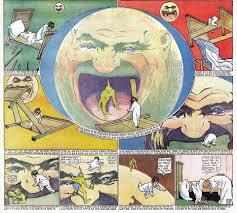 Little Nemo would then have been the catalyst that got Burroughs writing as he tried to emulate it in prose. As usual ERB combines a multitude of influences. He even states that the work is written in Ragtime Talk which meshes quite well with McCay. Minidoka in itself can qualify as surrealistic before surrealism as does Mccay. That would not be extraordinary as the period from, say, 1880-1910 had a unified outlook not unlike the Sixties music scene when all bands played around a central motif. As the work couldn’t have been written without McCay influence that places its probable composition date firmly in the 1908-10 range. 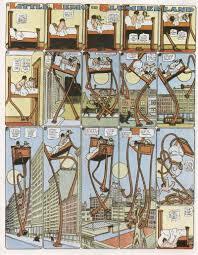 I heartily recommend the Taschen Little Nemo as an example of the current bookmaker’s art as well as for the astounding work of Winsor McCay. This rather astonishing video is available demonstrating McCay’s drawing expertise while showing him as the film creator of animation. 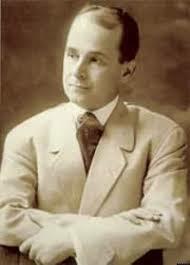 He not only influenced Burroughs but Walt Disney said his own work would not have been possible without McCay. A 1998 Japanese made movie called Little Nemo’s Adventures In Slumberland is available on Netflix. Ray Bradbury, no less, provided the story line. https://www.youtube.com/watch?v=kcSp2ej2S00 There are numerous other videos too.